WOODS, WILDLIFE and WATER outdoor nature fabric. 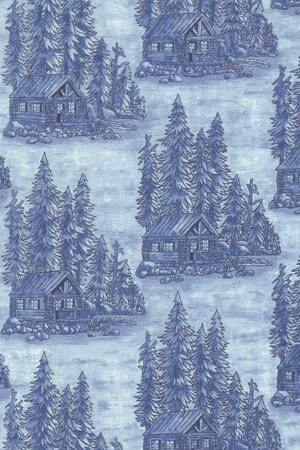 Woods, Wildlife and Water outdoor/nature fabric shows a cabin in the woods in shades of beautiful blues. Add this nature fabric to the hunting enthusiast in your life and you will have a happy person in your life. Check out the other coordinating fabric to this line of fabric. All fabric from The Quilted Nursery is cut directly from the bolt. Repeat buyer, lovely fabrics at great prices, and fast shipping! Love the bag they came in, and thank you for the lovely card!